Well-educated young adults are increasingly moving to cities and propelling city growth; their numbers are up 19 percent since 2012. Counties are the wrong units for measuring whether city centers are growing or not. (We explore how misleading this is, using Chicago as an example). In overall population growth, cities are performing better than they did in the previous decade, suburbs are performing worse than they did a decade ago. We’re bumping up against the limits of how much cities can grow: For a while they could grow by reducing vacancy in existing housing; now they have to grow by building new units. That’s happening, but not fast enough. People are paying a premium to live in cities; The value people attach to urban living (diverse, interesting, walkable neighborhoods) continues to rise relative to auto-dependent suburbs. In this case, price rather than quantity is a better measure of preference. “The suburbs are back, baby” or so we’re told. The trend of people moving to metros with the densest urban cores—a mainstay of media coverage—is clearly over. But every year that passes, the more population patterns are starting to look like the old sprawling dynamic serving suburban and exurban demand. CityLab tracks down Joel Garreau, who coined the term “Edge Cities” back in the 1980s, to reprise his views on suburban triumphalism. He dismisses city growth as limited and exceptional, confined to just a few rich cities. Let’s start with the population estimates. Jed Kolko has done a neat job of parsing census data, dividing counties in the nation’s large metro areas into broad categories of city and suburb. He correctly notes that in the aggregate, counties in the “suburb” category have added people faster in the past year than counties in the “city” category. But a we’ve pointed out before, counties are fundamentally the wrong unit for measuring urban growth. County boundaries vary tremendously from region to region, and seldom match up with dense city centers. (See the discussion of Chicago and Cook County, below, for a detailed explanation of how county data conceal rapid growth in the core by combining it with declining first-tier suburbs). It’s also a mistake to look just at domestic migration data. For example, Kotkin and Cox repeatedly point out that big cities like New York and Los Angeles are experiencing high levels of domestic out-migration. That’s actually always been true because these cities are immigrant gateways. Domestic migration only counts those who lived in the US in the past year, and so misses foreign immigrants. The combination of births, international immigration and still considerable gross flows of in-migrants have fueled growth in large cities. Who is moving to cities? The raw numbers tell part of the story, but what’s equally important is to look at who is moving to cities. We’ve been carefully following these data for more than a decade, and we’ve seen a consistent, and accelerating trend: it’s well educated young people who are fueling city center growth. In our 2014 report, the Young and Restless, we showed that close-in urban neighborhoods–those places within three miles of the center of the central business district, have been adding college-educated young adults twice as fast as in their surrounding metropolitan areas. We updated this analysis earlier this year, looking at data on city population growth. The number of 25-34 year olds with four-year degrees living in large cities is growing almost twice as fast as that demographic group is growing outside those cities. In just the past five years there’s been a 19 percent increase in 25-34s with a college degree. The preference of young workers for urban living is drawing more firms to city centers, generating additional jobs for workers of all ages. Some, like Conor Sen, try to claim that this back to the city movement will peter out as millennials age and have children. But this view conflates life cycle changes with generational shifts in preferences: older adults are always somewhat more suburban, but less so than in previous decades. And as Millennials age out of the 25-34 year old age group, they are being replaced by an equally numerous next generation, that is similarly, if not more urban-oriented. Focusing just on population changes, implicitly makes a naive and questionable assumption about revealed preference, that everyone is getting to live exactly where they would prefer. But we have good reason to believe that lots more people would like to live in cities if we built enough housing for them. The most powerful evidence on this point is the high and rising price premium that is being paid for urban housing. A variety of studies have confirmed this fundamental shift. Here’s the data on relative home prices (In constant dollars) compiled by Columbia University economist Lena Edlund and her colleagues. 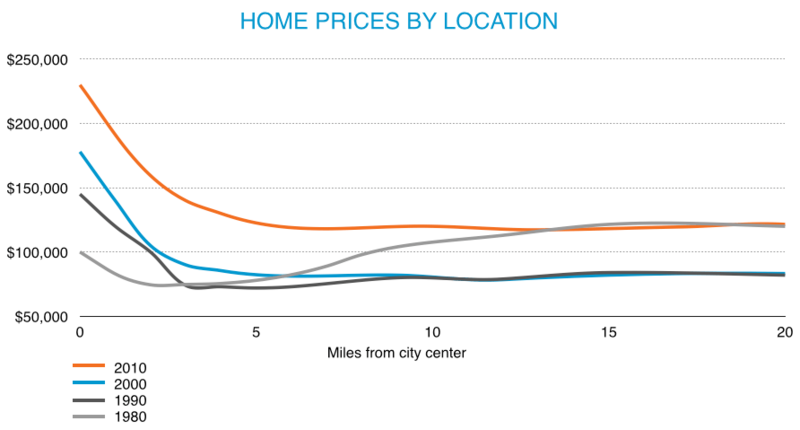 Homes located in the urban center now command much higher prices than they did two or three decades ago. As we’ve noted this relative price increase in the most urban neighborhoods compared to suburbs constitutes a kind of “Dow” of cities, and reflects the value Americans attach to urban living. Data compiled by Fitch from the Case-Shiller repeat sales home price index shows that over the past 15 years or so, prices for the densest urban neighborhoods have increased about 50 percent faster than for suburban housing. The urban price premium is driven by a growing demand for cities, but more recently, it also reflects a constrained supply. For a while, cities could grow faster than suburbs by reducing vacancies. But vacancies have shrunk, and now city population growth is bumping up against the limits of urban housing stock. As is most evident in places like San Francisco, demand for urban housing has increase much faster than supply, with the result that prices are high, and many people who would like to live their (or who did until recently) can’t afford the rent. So far from illustrating the demise of the demand for cities, the somewhat faster recent growth of suburbs is fueled in part by the fact that we haven’t addressed our shortage of cities. It’s illuminating to look to see how these trends play out in a particular city. In some respects, Chicago is the poster-child for city population decline. But if you look in detail, you see a strong urban center and decline in the suburbs. County-level data mask the growth in the downtown Loop and nearby neighborhoods. It’s actually the case that these parts of the city of Chicago are booming and gaining tons of smart young residents. Keep in mind that Cook County, Illinois, encompasses the city of Chicago–and dozens of surrounding suburbs. Cook County is losing population in the aggregate, but chiefly in its aging, first-tier suburbs. But Cook County is huge, and only partly the center of the metro. Downtown Chicago is booming (with 47 high rises under construction–mostly for new housing). Our analysis earlier this year shows that in the four years, 2012 to 2016, the City of Chicago (not Cook County) added 42,000 25-34 year olds with a four year degree, up 17% over just five years.
. . . according to demographers at the Chicago Metropolitan Agency for Planning, Cook is just returning to the slow decline that pretty much halted during the subprime mortgage recession, in which migration nationally slowed to a crawl. Slow employment growth in many sectors likely is the reason, she says. “Our job growth is just lower than (in) other regions,” for middle-skilled positions in fields such as manufacturing and administration that require some post-high school education but not a college degree. But among the college-educated, the region continues to grow. When you look city-by-city at the data, its apparent that urban centers are extremely robust, are attracting more talented young workers, and the firms who want to employ them. What cities everywhere are bumping up against, however, is the slowly growing supply of housing in great urban neighborhoods–a fundamental fact reflected in the growing city housing price premium.